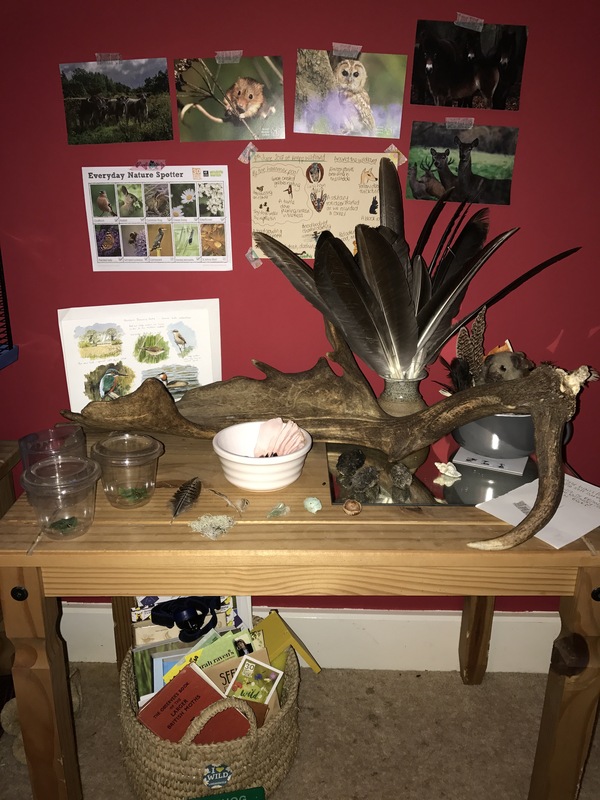 Did you have a nature table at school as a child? Or have you seen them in a nature centre or reserve? 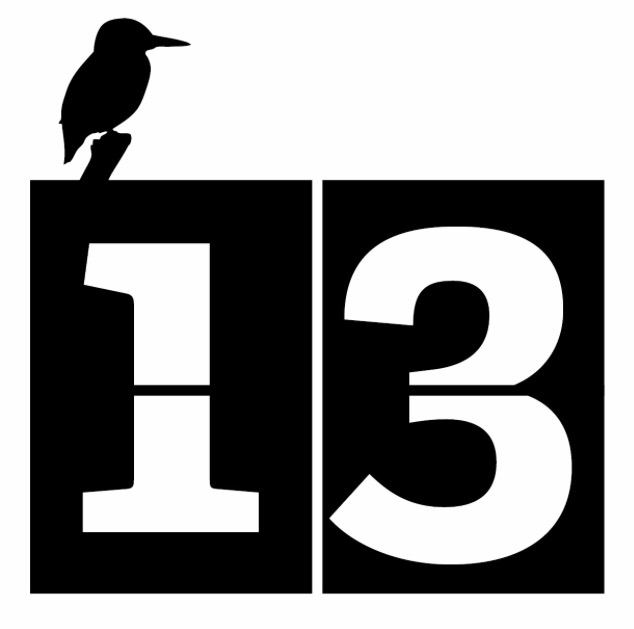 A place with selected natural ephemera to enchant and enlighten, a bird’s nest, seeds, nuts, a skull perhaps. 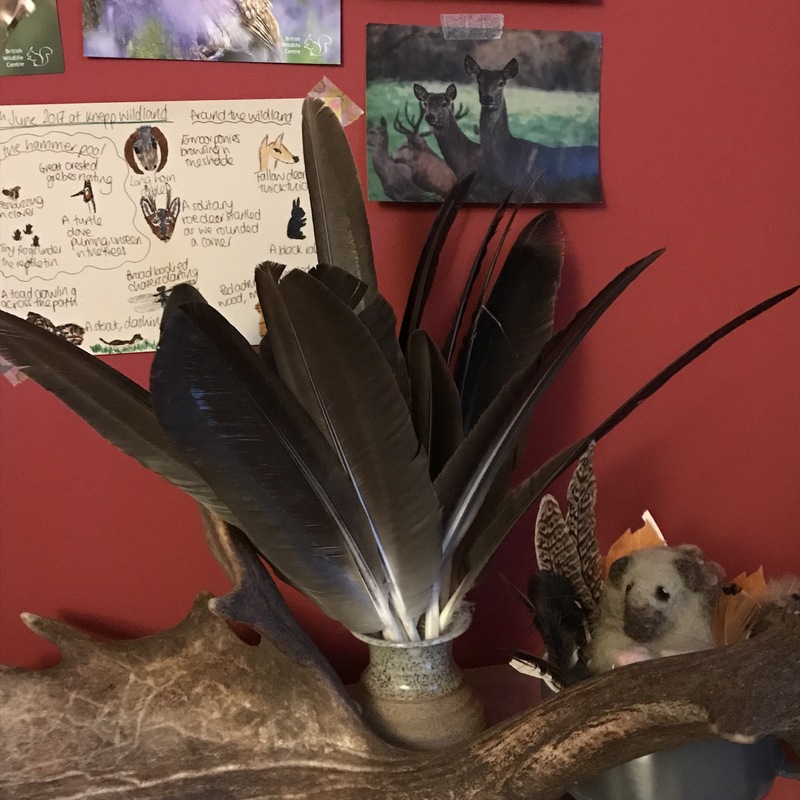 I love to see a nature table, to explore the varied objects gathered, to imagine where they’ve come from. 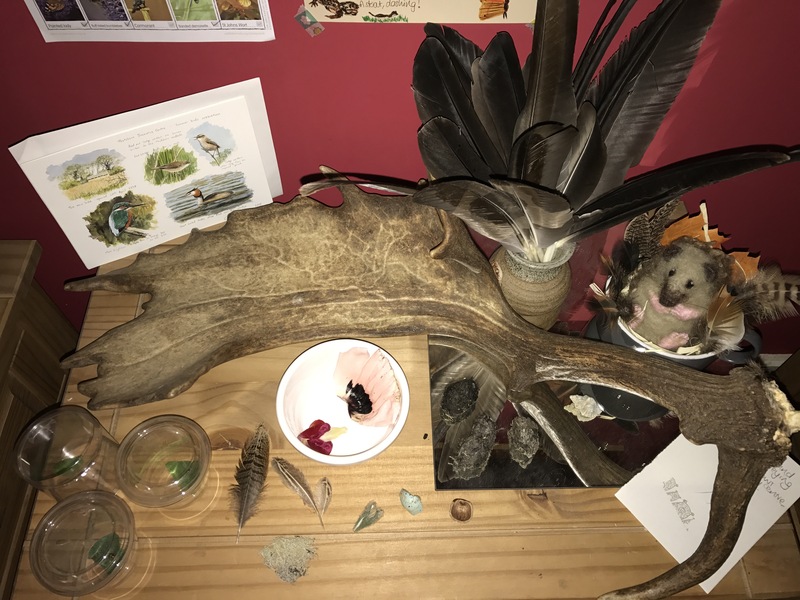 We have the top of a cabinet covered in our natural curios gathered over the years, from fossils to skulls, birds nests to insect exuvia, sea glass, shells, interesting rocks and even a snake skin. 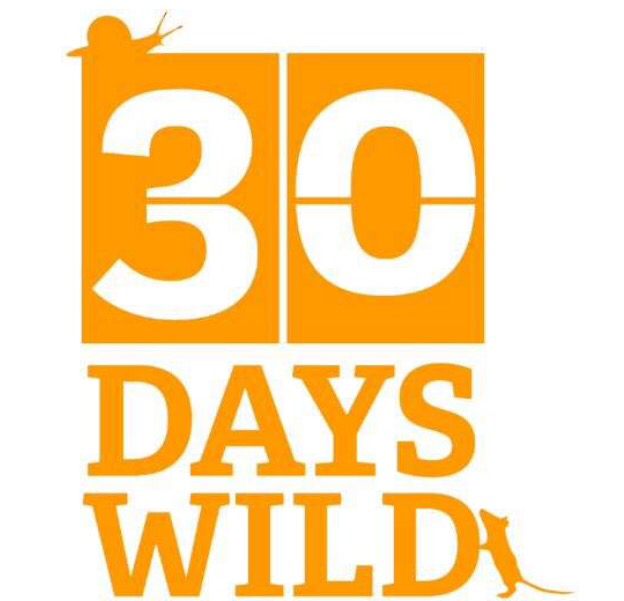 For this month’s 30 days wild challenge I’ve started a new nature table in the living room to gather the physical reminders of our June wild times. Most of the objects are found items, picked up when we’ve been out and about, a couple of them are bought from places we’ve visited. 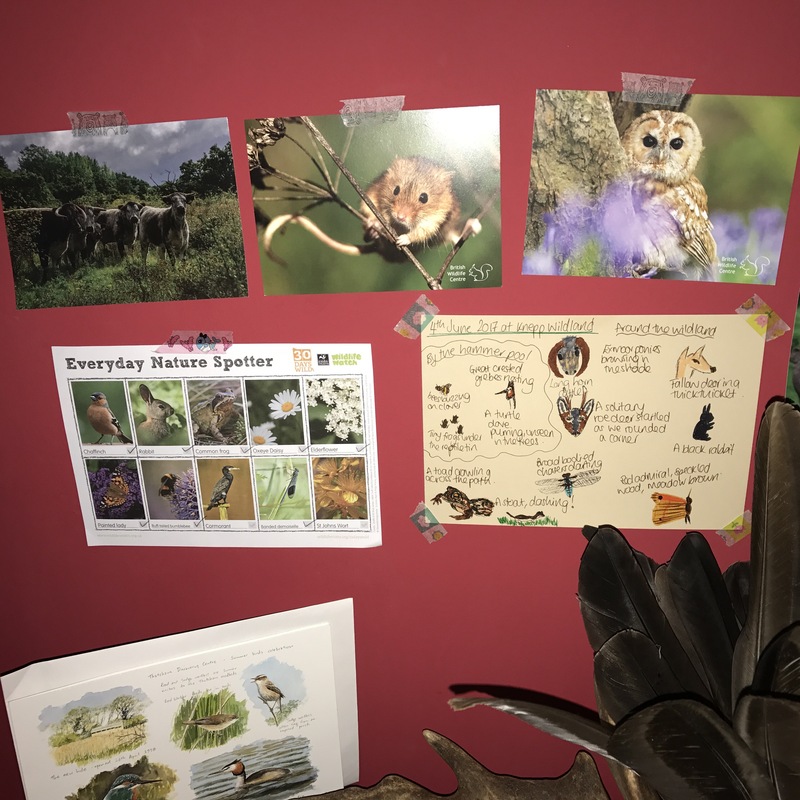 On the wall I’ve stuck up the spotter sheet that came with the 30 days wild pack from the Wildlife Trust’s, almost all ticked off, a day’s record from my nature notebook and postcards from places we’ve been of animals we’ve seen. 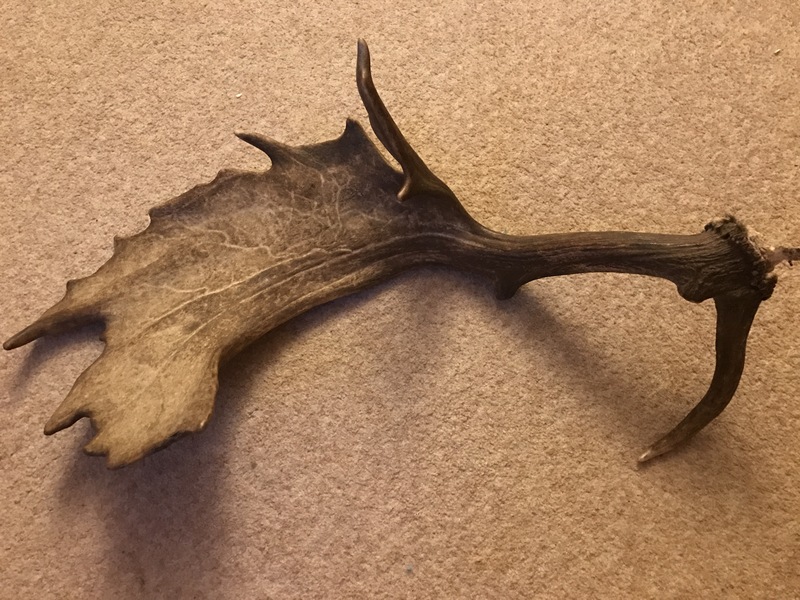 A fallow deer antler, bought from Knepp Estate, where herds of fallow deer roam the rewilding project. It’s a beautiful thing, deep ridges in the bone showing where the blood vessels supplying this fast growing bunt protruberance ran. It’s heavy and dense. 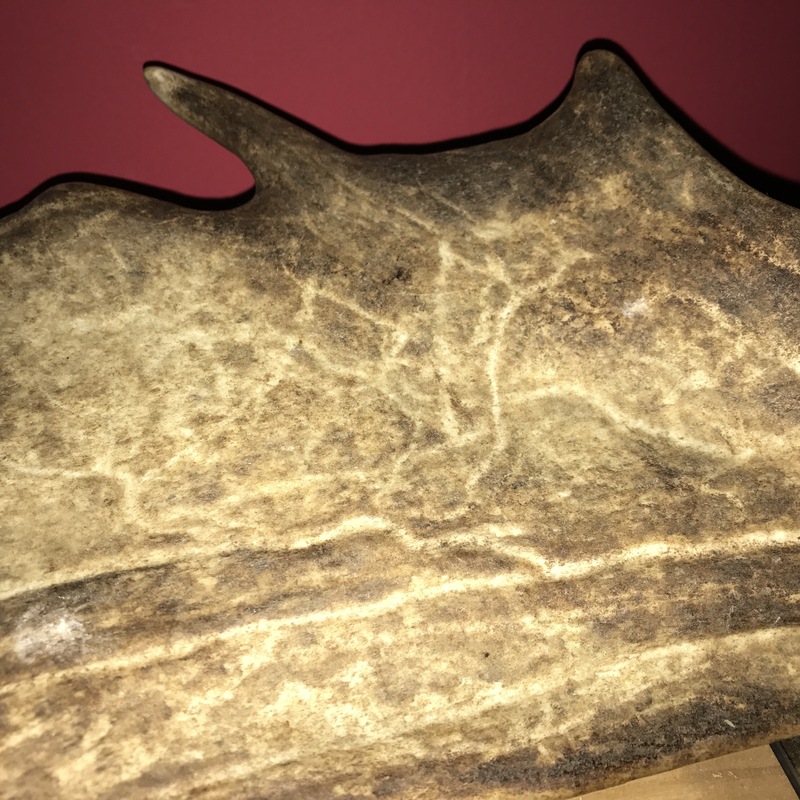 When the deer shed their antlers it must be a relief to not have to carry around such a weight for a short while. This brings to mind for me the happy times spent at Knepp last weekend and a visit we made last Autumn, where we watched the fallow deer rut, a real natural spectacle! 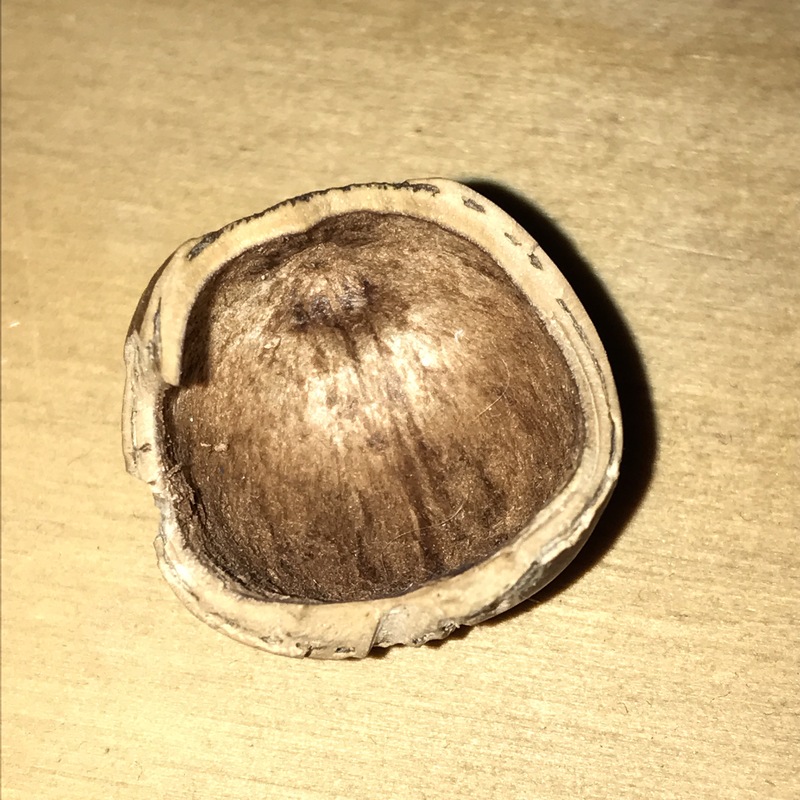 A nut chewed by a red squirrel, found at the British Wildlife Centre, interesting to see how they split the tough nutshell with their sharp teeth. 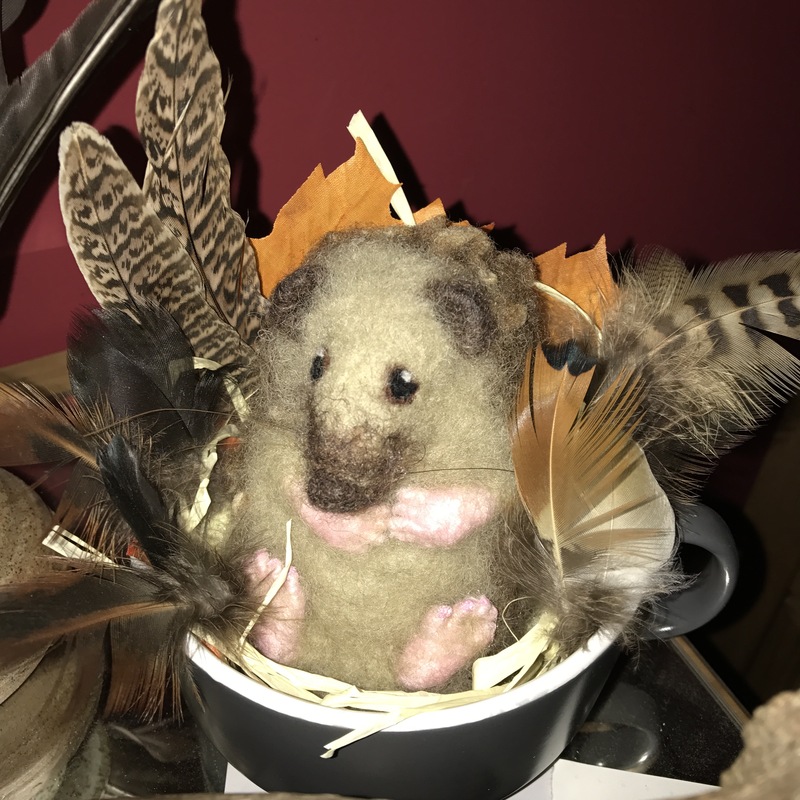 A needle felted hedgehog, bought from a very talented lady at the Floral Fringe Fair, in honour of our garden hedgehog, feathers found in the last two weeks added to his nest. 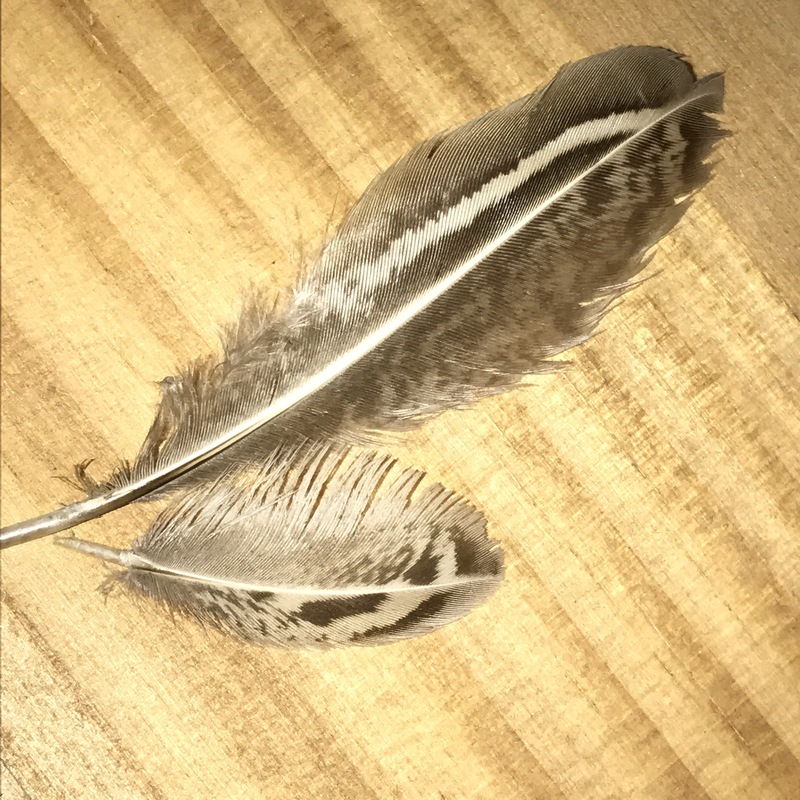 Feathers found while walking the West Berks countryside this weekend, a close up of a pheasant feather and two small delicate feathers, as yet I have not identified the bird that shed them. I love feathers, so delicate and beautiful. I like to imagine where they lay on the bird and how they fitted into it’s plumage. 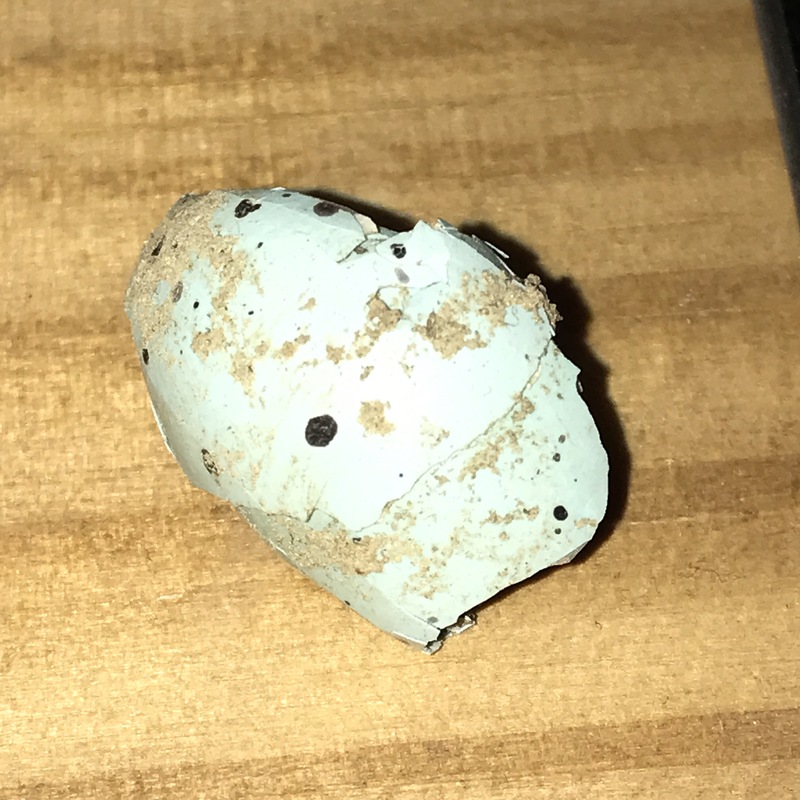 A fragment of egg shell, discarded on a field path. I imagine the mother bird removing this from her nest, taking it a distance away so as not to attract predators. I hope it’s inhabitant is safely fledged, Wild and free. 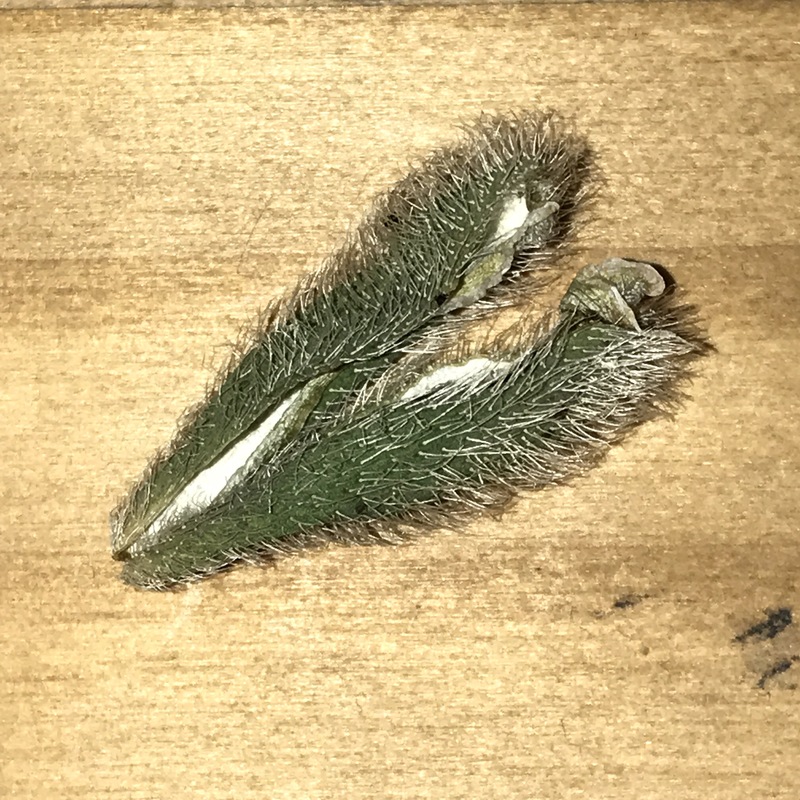 The spiky case of a newly opened papaver flower from the garden, delicate petals unfurled this morning, leaving the case dangling gently in the breeze. 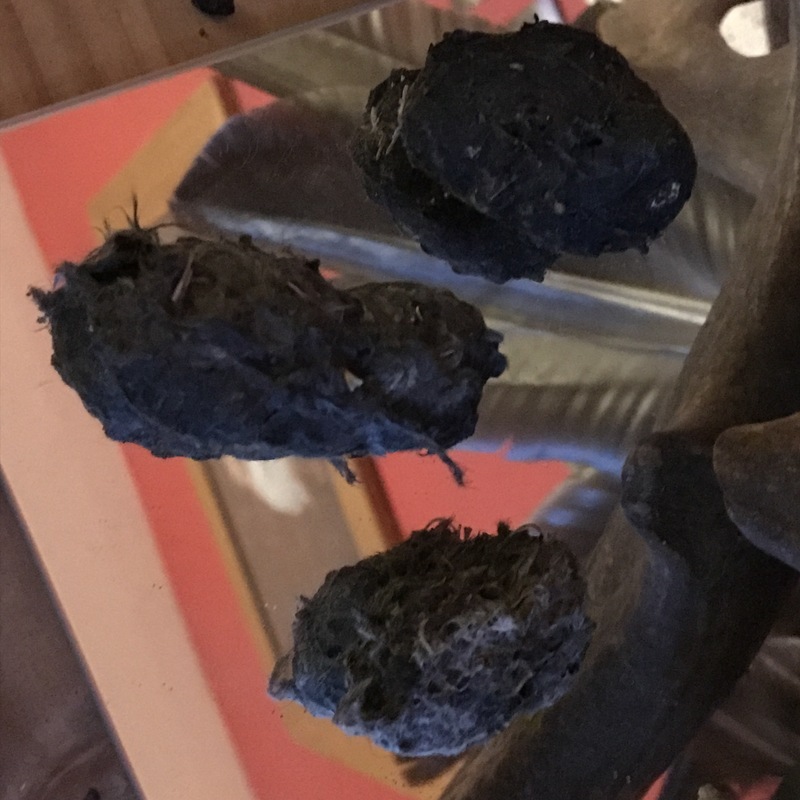 Barn owl pellets found below an old oak tree, one will be dissected soon, I can’t wait to see what we find inside, I loved Chris Packham’s idea on Springwatch this evening of owl pellets as free gifts. I’m not sure I’d necessarily want to find one in the cereal but they’re definitely be more exciting than the tat you get inside a kinder egg! Badger hairs found caught in barbed wire while settvsurveying, grey at the base, then black, white tipped, coarse. I love the way they feel when rolled between your fingers. 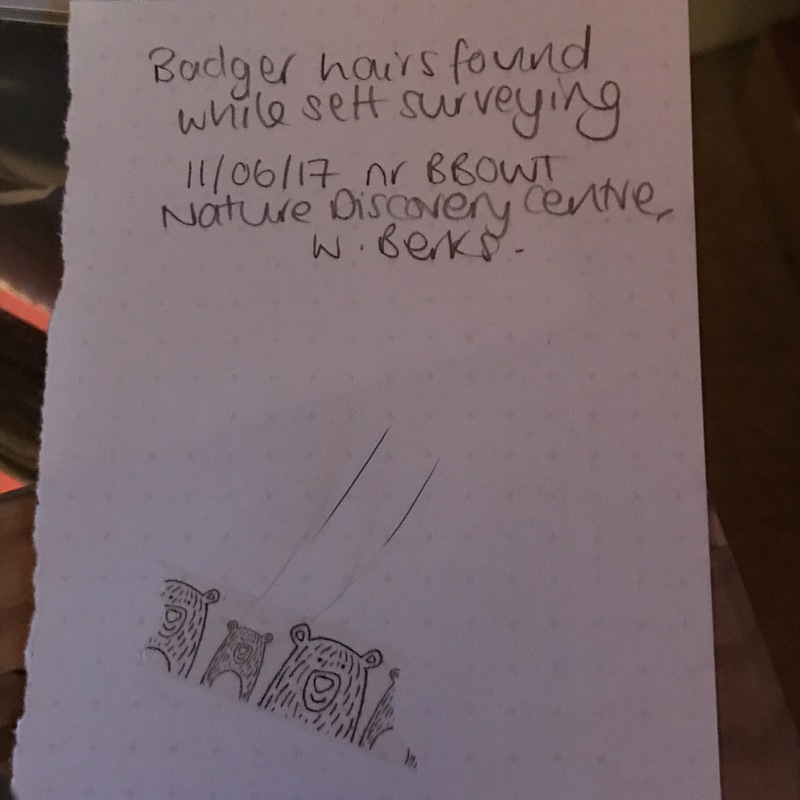 I wonder where the badger went on their nighttime wandering day? What they saw? Canada goose feathers, they lay scattered along the lake shore at the nature discovery centre. 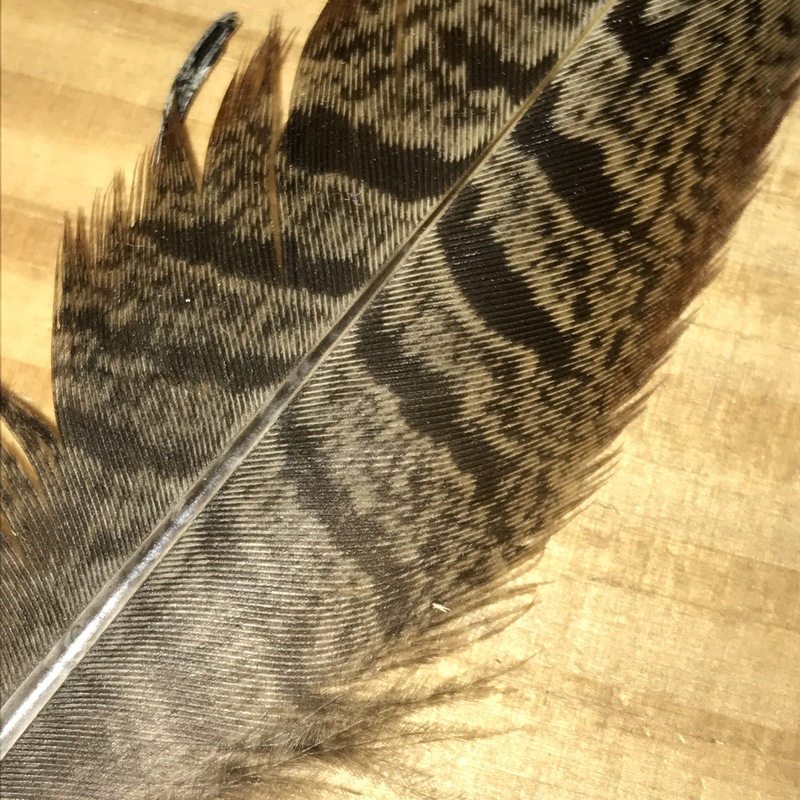 Only the large ones though, no Down or smaller feathers, I wonder if these were from grooming or predation. They are perfect for quills, ripe for experimentation. Pair lichen found on the Heath, intricate and beautiful, a tree in miniature. 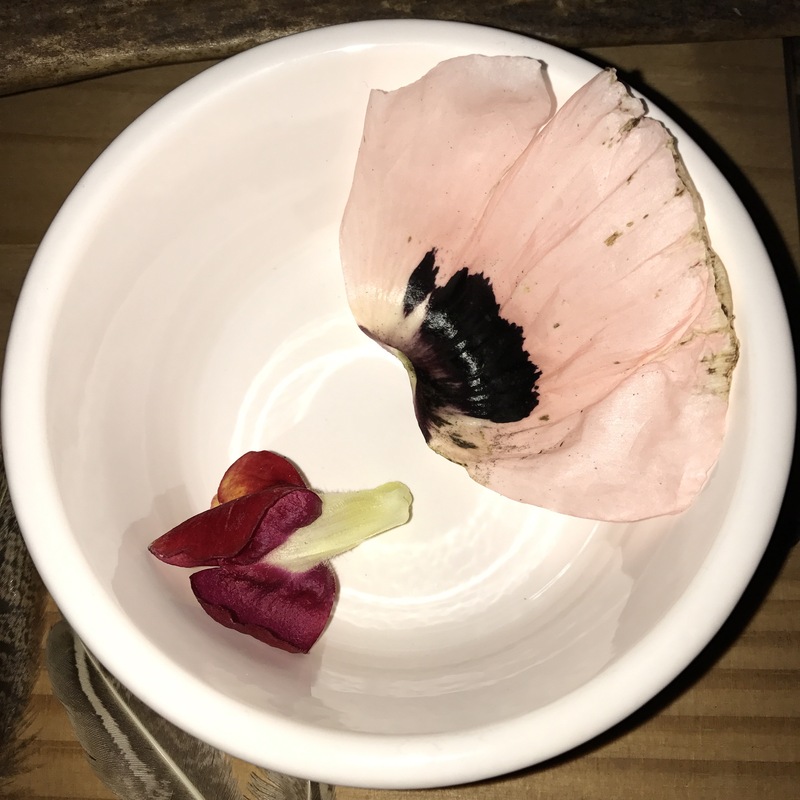 Ephemeral finds, petal and flower dropped from garden plants, brought inside to admire. The snapdragon always makes me happy, a reminder of happy childhood days. Living creatures on the nature table. 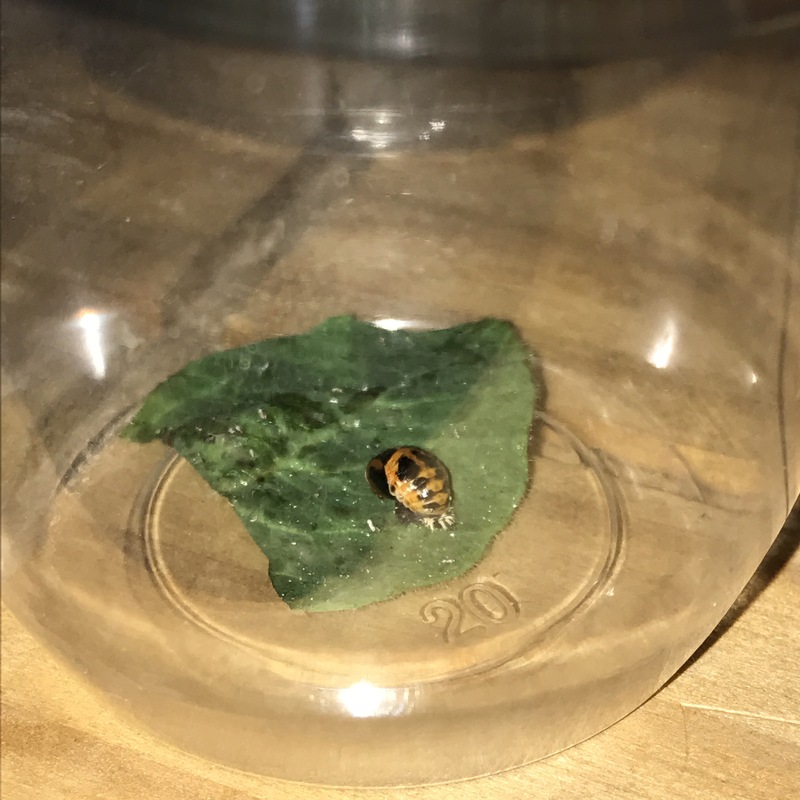 Harlequin ladybird pupae brought inside to see what will emerge, ladybird or parasite? I’m checking for changes all the time, impatient for them to change. 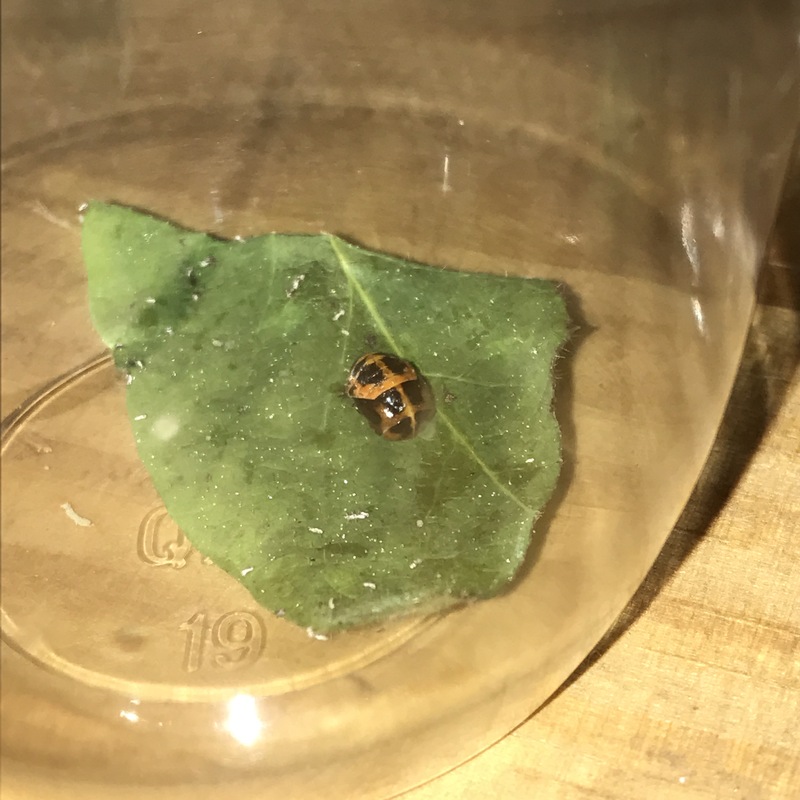 Do you have a nature table at home? 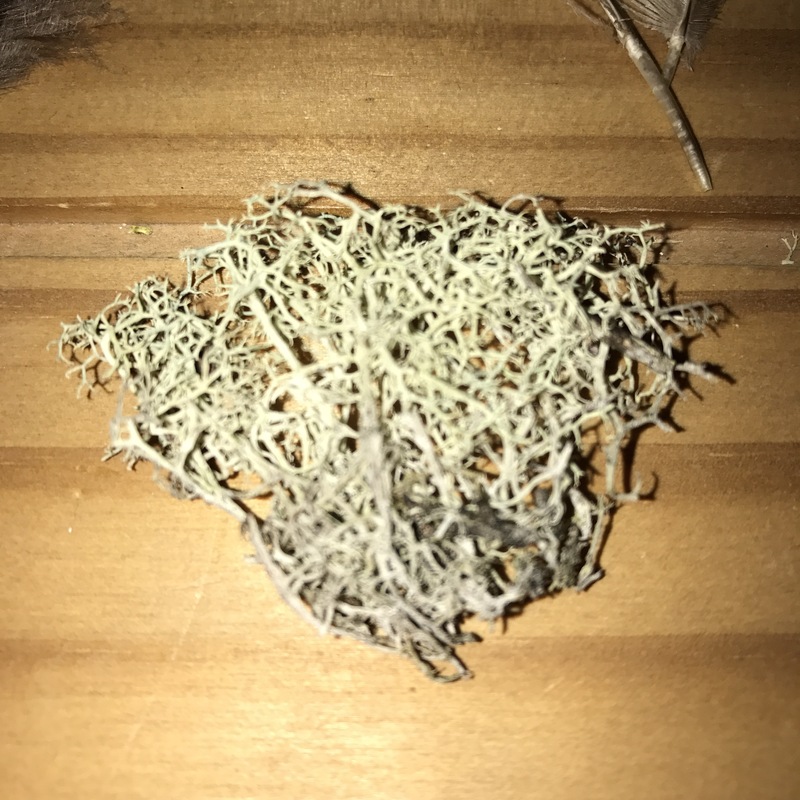 What’s your favourite natural find? Love love LOVE this! ❤ I have so many random curios, I'm obsessed. In the middle of redecorating, but I can't wait to get them out on display again once the house is less chaotic. I found a poor dead damsefly yesterday, think it had flown into a car. So sad for the critter, but amazing to be able to study it up close. This is such a wonderful idea :). Love it!